I love the light on these pears. It must be hard living in another country, I can't imagine. It was probably wonderful and sad to watch the olympics and see China. Ah, you make it look so easy and effortless.... (*wistful sigh*) These pears are brilliant. Another beauty, executed with such confidence! I'm happy that the Chinese got their moment to shine. It must be difficult to leave your homeland. You are a marvelous painter, Qiang! 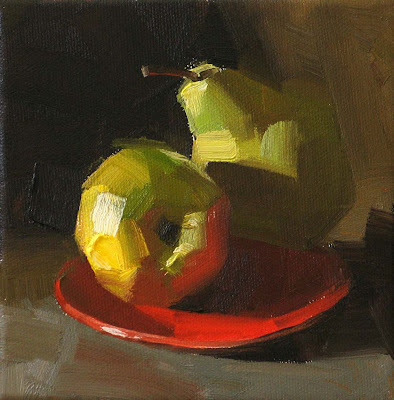 Just want you to know that I love the light in your paintings, especially in this one of two pears. I look forward to seeing your art displayed in the daily paintings each day.